This is a scene that has become part of my everyday for several years now. I work in what most would consider rural, South Carolina. 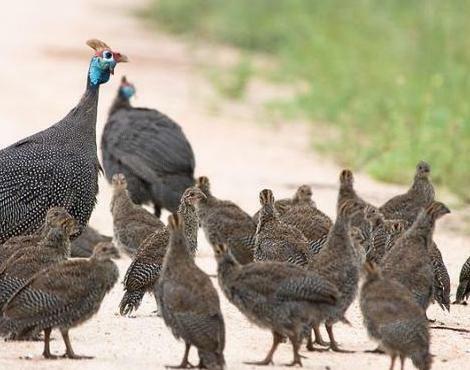 While the school I teach in is in the city limits, most metropolitan areas of the world would not expect to wait on crossing Guinea Fowls during their morning commute. Every morning, when I turn off the highway onto the road where I work, my son and I pass a modest farm. We know the owners, and I have taught their grandchildren in school. We often look to see what animals have decided to venture out to the pastures in the cool morning. Some mornings we see horses, other mornings it is only goats. However, nearly everyday we patiently wait on the dear Guineas to decide which side of the road they happen to prefer on any given morning. Many mornings I chuckle at their awkward, slow walk down the center of the road. Other times, I insist they are taking my valuable time, and would wish they would put a little pep in their step. My little boy finds this amusing. We laughed together this morning at how unconcerned they are with what would seem, to them, to be our enormous truck. They never scurry, fly, or even seem to care. The horn does little to rattle their nerves. They don't appear to be very bright...or maybe they are merely stubborn creatures. Whatever the case, I couldn't help but think today of the comparison of these fragile birds to fragile humans. How our Maker must chuckle at our stubbornness when we refuse to see the obvious in front of our faces. He must certainly wait quite patiently on us to decided just which side of the road we will choose. He knows how bright we are and are not. At any moment, He could wipe us out in one swoop, but His loving and gentle hand rests while we mosey through our days. He even cares which side of the road we choose and if we lose any "feathers" along the way. I am but a speck on this great, vast Earth. However, my Maker cares for me as His very own. He shelters me from harm, feeds me daily, and allows me to make stubborn, silly choices. The little moments God uses to speak to us should never be taken for granted...even those when waiting on the Guinea Fowl to cross to the other side. May your day be filled with moments with your Maker. Leah, this was wonderful and I can relate on how we can look at moments like this and just wonder how God stays calm with us. I hope you guys are doing great! Dad has guineas and the honking noise they make can be quite obnoxious - just to add to the list of comparisons to us humans!